I actually got to make my Make it Monday Card on Monday! for the rose i used 4 colors. I started with some Spiced Marmalade in the center of the rose. I added some Wild Honey around the center. I blended in some Dried Marigold next. I added some Wild Honey to the lines of my flower petals with my fantastix coloring tool and then blended the whole thing with Scattered Straw. and blended in some Peeled Paint. 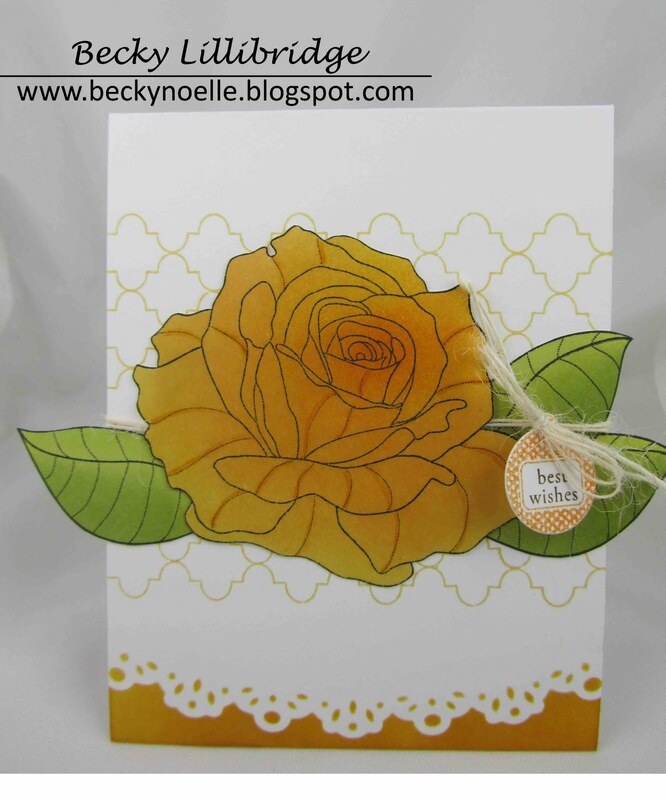 for the bottom of the card i cut some cardstock with my doily edger die and temporarily adhered it to my card front with post-it notes. Then i sponged some Scattered Straw & Wild Honey ink on top! Thanks so much for stopping by! Please leave a comment and let me know what you think! Beautiful flower! I love the tiny tag too. So the background is one layer, right? Wow! I'm glad you did pictures because I couldn't even tell--what a fun use for this technique, Becky! Wow! Really nice! I love you colored the rose with the inks! You did an amazing job! What a lovely card! The step by step pictures are very helpful. Wow, this is fantastic and I particularly like the stencilled edge of the card. Great out of the box thinking! Very beautiful, really love that rose, so striking! Congrats on the tweet! Hugs!